More about Linux vs Windows hosted ASP NET Core applications in Azure Application Service Plan – Roberto Prevato – Applications architect, DevOps, graphic designer, metal head passionate of philosophy. In my previous post I wrote about performance comparison of ASP.NET Core applications hosted in Windows vs Linux + Docker, inside Azure Application Service Plans. Since this topic is interesting for many, I decided to write more about it. 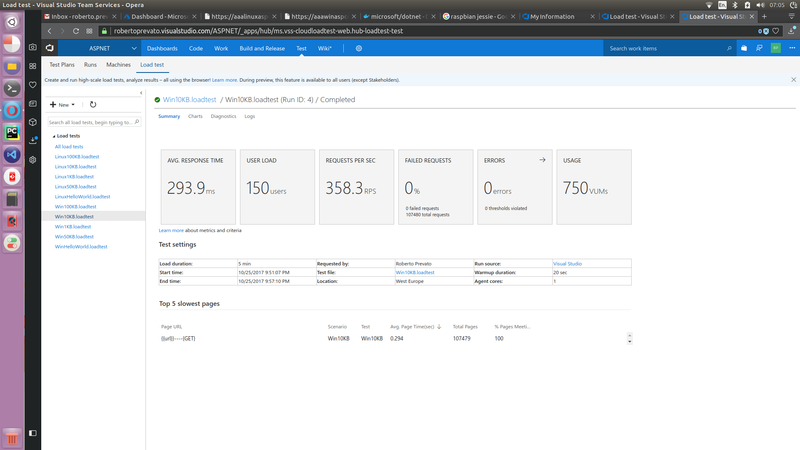 I tested again using a more repeatable and trustworthy approach: generating web load using Azure Cloud Agents; with Visual Studio and VSTS, in the cloud. Moreover, all previous tests were executed using HTTP, new tests use HTTPS. 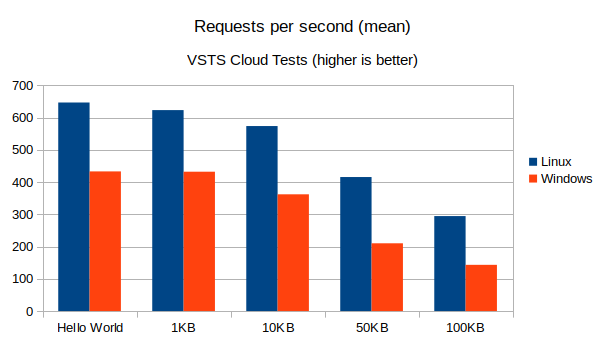 Running the tests in the cloud! Output includes a useful summary, graphs and errors report about violated performance thresholds, such as high CPU usage. I used the same tests prepared for the previous blog post and published here: https://github.com/RobertoPrevato/ASPNetCoreHelloWorld. 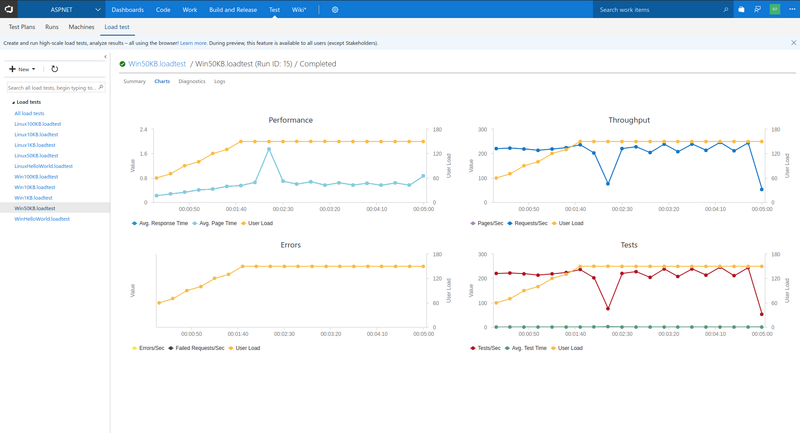 Results are consistent with those obtained generating load from a computer connected through wire to the internet: the same ASP.NET Core application deployed in Linux and Docker is much faster than one deployed in Windows host (both inside Application Service Plan). 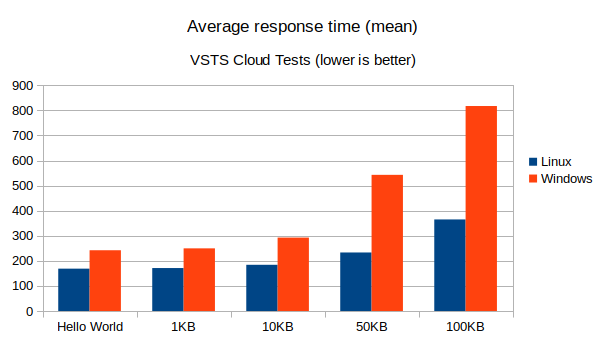 These new tests show an even stronger dominance of the application hosted in Linux, especially when serving responses with bigger bodies. Almost all load tests on Linux host caused the surpassing of thresholds for Processor: %Processor Time, while none of tests run on Windows host produced the same kind of warning. I am not quite sure to understand the documentation when it describes this performance counter, included by default in all new load tests created using Visual Studio. If any reader may help me commenting below, I will be glad to know. More graph pictures can be found here: https://github.com/RobertoPrevato/robertoprevato.github.io/tree/master/images/posts/aspcoredocker. 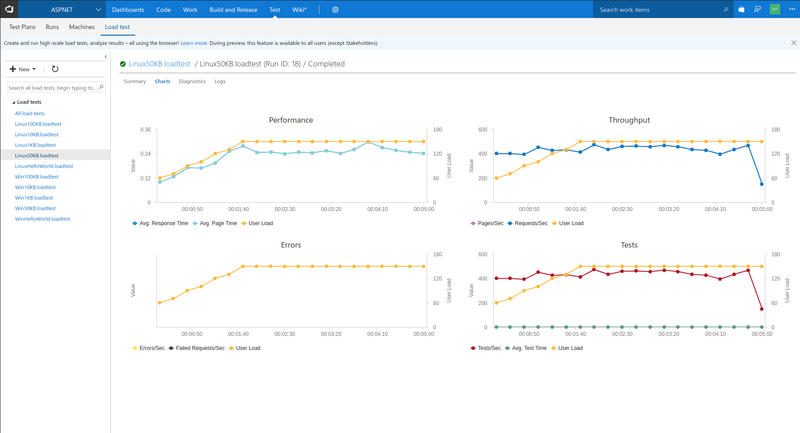 At the light of my previous tests and the load tests described here, hosting applications using Linux and Docker in Azure Application Service Plan is a good choice, under performance point of view. I have no interest in making Linux look better than Windows - I published all source code of my tests and instructions on how to recreate the environments, if anybody suspects I tweaked the results or done anything wrong, she’s welcome to repeat them and demonstrate my mistake. It would be good if somebody did a peer review of what I did. 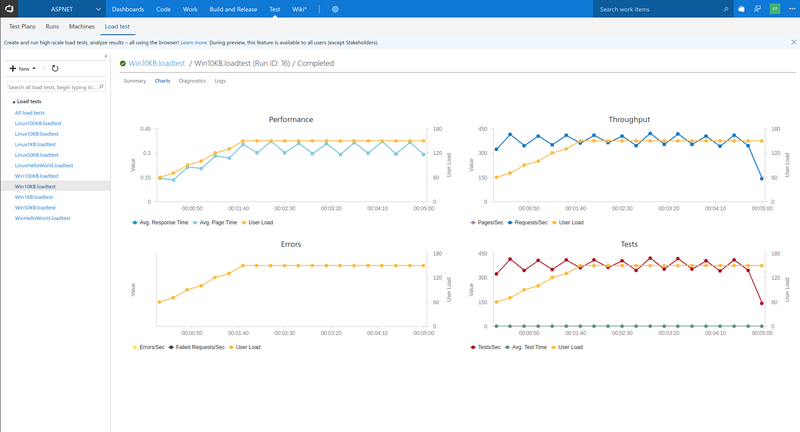 I decided to run these performance tests and to share the results, just because I am planning to create a web service for an application I wrote using Python, and I was wondering whether I was going to get satisfying performance using a Linux host with Docker, in Azure Application Service Plan. For this service I am planning to use PyPy 3, Gunicorn, Gevent and Flask and as it happens, this stack seem to perform faster than ASP.NET Core with Kestrel - but this is yet another topic and I didn’t do complete tests.